Starting a new business in 2016? 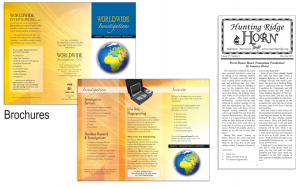 One of the many things to be considered for your new business is what printed materials it will need. This can range from business cards, to letterheads, to flyers—many startups need a lot more printed marketing essentials than they realize. Make sure you don’t miss these important printed marketing essentials for startups. Have You Set a Print Budget for This Year? Marketing and branding are very important aspects of your business. They help you to reach a broader customer base, and familiarize your business with potential new clients. As with all aspects of business, planning and organization need to go into every decision, which includes setting a print budget for the new year. Posted in Professional Printing in Baltimore | Comments Off on Have You Set a Print Budget for This Year? Does Your Business Need a Logo Redesign? Your business logo is one of the first things customers will see and be able to make judgements based on. This logo should embody the principles that your business stands for, and create a memorable, lasting impression on customers. Without a great logo, your business might not have this lasting impression. So is it time for a logo redesign? Posted in Professional Printing in Baltimore | Comments Off on Does Your Business Need a Logo Redesign?